You can also listen to my Interbike Podcast and an interview with Grant Petersen--Click here! The first thing that caught my eye at the Outdoor Demo was the Exycle, a two-weel drive bike with arm power for the front wheel, leg power for the rear. I took it for a ride, and it worked quite well. I was impressed with the engineering, and how light and well made it is. I'm not altogether sold on the concept and some of the claims made for it, though. It does perhaps permit temporarily higher power output for a brief sprint or a short climb that can be done anaerobically, but I don't believe it would have any real effect on average speed. I could see it being of some value as a training bike for triathletes, though I'm not sure the arm muscles it builds up are exactly the same ones a swimmer needs. It also might have some application for offroad use where the two-weel-drive feature could be useful. When you're not "pedaling" the handlebars, you're advised to keep them all the way in or all the way out. I found the wide position too wide for comfort, and the narrow position too narrow for good control. I didn't try riding with one hand only...this might be rather dangerous unless the manufacturer can provide a way to lock the bars in position. My guess is that this will never appear on the U.S. market due to the liability climate that prevails here. Another item that interested me was the Jeff Jones "H Bar". I didn't get to ride this, but I was very impressed by the design, and plan to investigate becoming a dealer for this product. The exhibitors have discovered the persuasive power of free food and free beer, which was everywhere this year. Below left is a shot of the excellent PowerBar barbecue. Park Tools has a mechanic race in their Outdoor Demo booth, always a popular event. For me, the big hit of the show was at the Surly booth, whre I got an opportunty to ride their amazing "Puglsey" bike. This all-surface machine resembles the "rolligons" of classic science fiction with its super wide tires. They had shown prototypes last year, but this year they have prduction machines available. This was a very courageous undertaking for Surly/QBP, because to make it happen they had to tool up for a lot of specialized parts. The super wide (4 inch!) tires required super wide rims, , hubs and bottom brackets. The hubs are offset to the right. The offset is required to permit the chain to clear the megafat tire. The frame is asymmetrical, permitting the rear wheel to be dishless. They also use an offset "rear" hub in front hub with an asymmetrical fork, making the two wheels interchangeable! The front hub is set up to accept a singlespeed freewheel, and the rear uses a normal cassette Freehub design. The frame and fork have cantilever bosses, but I don't realy understand why, because I don't think the 4 inch tires could clear the cabling of any normal cantilever, either center-pull or side-pull. This bike really wants disc brakes, and the demo models were equipped with Avid mechanicals. You can appreciate the concept intellectually, but actually riding this machine is a near life-changing experience...It looks heavy because of the fat tires, but they are, after all, mostly air! It's actually lighter than many dual suspension bikes, since it doesn't need any complicated mechanical suspension. I took a test ride up a loose sand/gravel slope and was amazed how well it climbed. I'm a 61 year old fat guy, but I was passing skinny youngsters on fancy dual boingers with ease. This is going to be the bike for sandy terrain like Cape Cod, and it's reportedly great in snow as well. The Euro-Asia Imports booth was showing new carbon fibre Bridgestone bikes, the first Bridgestones to show up in the U.S. since the Bridgestone USA folded its tents in 1994. Here's a blackmail photo of Grant Petersen, who just happened to stop by the booth while I was theree with my trysty Coolpix 990. Gilles Berthoud brought several beautiful bikes to the show, along with a selection of his wonderful bags. Here he is with his new quick-release handlebar bag. Aside from the Pugsley, the most exciting thing to me at the show was the new Blériot (say: "BLARRY-oh"), a joint venture between Rivendell and Quality Bicycle Products. The Blériot, named for the first person to fly across the English Channel, back in 1909, is a Taiwanese lugged frame built for 584 mm (650B) wheels. Looks quite pretty, and the frameset is expected to retail for around $750. It's very good news for fans of the 584 mm (650B) size, because it also means that Quality will be committing to supply wheels, rims and tires in this size. This should do a lot to reassure folks who have trepidations about using this wheel size. The big secret of the show was the new SRAM "road" group prototype. Theory #1 says that the inner lever moves just a little bit to shift to a smaller sprocket, push it farther to shift to a larger sprocket. Maybe a bit like the way a roller windowshade works. Theory #2 says that the upper part of the brake lever, above the pivot, can be pulled back (or the brake lever pushed forward) to shift to a smaller sprocket. The brifters look very slick, and the cables run under the handlebar tape. From looking at the rear derailer, it does not appear to be using SRAM's ESP 1:1 actuation ratio. My guess is that it will be Shimano compatible, like most of SRAM's other stuff. One of the first bikes I rode at the Outdoor Demo was one of the new Raleigh "Cadent" series. These are road bikes with shorter top tubes and taller head tubes, for riders who want a fast, sporty bike, but also want a more upright, comfortable riding position. I was very impressed with this bike. It's a rare road bike that I can be comfortable on without a stem swap. I've got very long legs, and by the time I get the saddle up high enough for good leg extension, the handlebars are typically 6 inches below the saddle, which I can't take for more than a couple of miles. This was also the first bike I've ridden with a Shimano 10-speed setup, Ultegra on this model. I liked the shape of the new 10 speed brifters very much better than the older 9-speed version. The ergonomics are greatly improved, at least for my hands. It seems as if everybody is getting on the fixed-gear bandwagon, but not everybody gets it. One model that looks like a real winner is the Redline 9.2.5, which comes with fenders, medium width tires, a flip flop hub with both a fixed and freewheel sprocket, moustache bars. Unlike most of the clones out there, it comes with pretty reasonable gearing: 42/15 fixed, 42/16 freewheel. Unfortunately, like all of the other fixies currently on the market, it has the old-fashioned rear-opening fork ends in back, making the use of the flip-flop hub much less convenient than it would be if it had proper horizontal dropouts. Sturmey-Archer is back in the Dynohub business, with a very nice looking unit that incorporates a drum brake. The generator side looks very Shimano-esque, but the drum brake looks like the previous Sturmey-Archer Elite models. I have high hopes for this product. Phil Wood showed a new tool for replacing the bearing cartridges in the new outboard bottom bracket systems. They claim that their replacement bearings are 5 times as durable as the stock units. a "Classic Swallow" without the edge stitching, but with a titanium undercarriage, which will be considerably more affordable than the current limited-edition hand-stitched version. The B18 is a revived design from long ago, a lady's saddle with very ornate designs stamped into the top, and the leather curving down over the front of the saddle nose. They also announced that all Brooks saddles will henceforward have bag loops in back, good news indeed for fans of classic British touring bags. Speaking of Brooks, it was a relief to learn that Bill Laine and Wallingford Bicycle Parts got through Hurricane Katrina without too much damage. Turns out that Bill's neighborhood is one of the few areas of New Orleans that is above sea level, so his stock survived unscathed. Bill is our major competitor in the online Brooks saddle business, but everybody in the business likes him, and we were all worried as he has been incommunicado on the internet ever since the August 28. Carradice showed an improved model of their Bagman bag support, we'll likely start stocking these with our next order. They also have a new dedicated bag for Brompton folding bikes, basically a modified Bike Bureau designed to clip onto a special fitting on the front of the Brompton frame. I had a nice chat with Carradice's David Chadwick, but didn't take any photos. 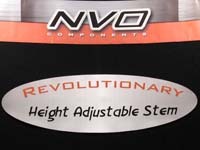 I was amused, however to look across the aisle from his booth to a both that was showing a "Revolutionary Height Adjustable Stem!" Whatever will they think of next! Here are a couple of other photos, not bike related. The white tiger was at the Mirage, where one of our suppliers invited us for dinner, and the shot of the skyline was made as I was flying out. I'm really sorry I didn't have my camera accessible on the way in, because I had a great view of Hoover Dam and Lake Mead. I was on the wrong side of the plane on the way out, though, and missed both Hoover Dam and the Grand Canyon.